Over the past seven days, I’ve given three live presentations. It’s both fun and exhausting. I find myself energized by interactions with the audience, but also feel like the amount of energy I have to project far exceeds my normal capacity. So this begs the question: since I want to get in front of increasingly more people with the “Team Introvert!” message, how do I manage that without burning myself out? How can an introvert who feels called to share a story from the stage create a scalable way to get that story out to as many people as possible? You might be thinking, “Eh, that’s not me. 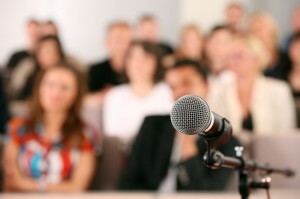 I’m not a public speaker, and I don’t want to be.” This is where I would respectfully disagree. Anytime you talk to anyone other than yourself, you’re public speaking. It’s not just about a stage, a microphone, and 100 people in a conference room eating rubber chicken. Public speaking is sharing your thoughts in a team meeting, introducing yourself to a small group of people standing around at a networking event, interviewing for your perfect job, or persuading your five year old that it really, really is time for bed. So now that you know I’m talking to YOU, I’m going to expand that definition a bit further. Consider this: the past 10 to 15 years have brought about a revolution in how we communicate. The internet, Skype, webinar platforms, and other technologies have made many of our daily activities location independent. Job interviews, networking events, educational offerings, and conference presentations can be shared in real time by people thousands of miles apart. We spend a lot of time preparing to put our best foot forward in in-person situations, but many of us find ourselves feeling a bit like the deer in the headlights when it comes to conversations that involve online video. To learn more about how to bridge the virtual divide in a way that is aligned with an introvert’s communication style, I turned to Nancy Ancowitz, “Psychology Today” blogger and author of “Self-Promotion for Introverts.” She’s graciously offered us some tips on how to become more confident and comfortable when we’re talking to a camera instead of a person. Beth Buelow: Most people don’t think of themselves as public speakers, yet we’re all speaking publicly every day! What are some not-so-obvious situations in which people would benefit from learning public speaking skills? Nancy Ancowitz: You can use every business meeting, class, gathering of your community organization, or even family dinner as an opportunity to practice influencing, inspiring, educating, informing, and just plain connecting with the people around you. Even piping up (succinctly!) during a Q&A session after a lecture is a form of public speaking—it’s also a way to get seen and heard with your input. So look for everyday opportunities to project your voice, make eye contact with your audience, and gesture naturally to support your message. BB: So much of our business communication takes place online. How is communicating through virtual platforms (such as video or Skype) different from in person? NA: A key difference between presenting online and in person is often your ability to see your audience. Unlike being in front of a room full of people, when you’re online, you can feel like you’re talking into a void. Yet, you want to look and sound natural—even conversational. Of course, it’s a challenge to read your audience when all you can hear is the equivalent of crickets. When you’re presenting in person, make eye contact with one audience member at a time for approximately three seconds—or the length of a typical phrase. If you’re uncomfortable looking directly into someone’s eyes, looking at her or his eyebrows or forehead will have a similar effect. Presenting online is a different story because your “eye contact” is mainly with the camera. If you’re an introvert, you may tend to look away when you’re thinking. Be mindful of how it appears when you’re lost in thought in the fast pace of online video. Prepare thoroughly so you aren’t caught off guard. Also be mindful of the rate of your speech. It’s crucial to keep things lively when you’re speaking online. Hand gestures take on a different dimension in person versus online too. In person, you often have a larger berth for gestures because of the space around you—unlike when just your head and shoulders are on YouTube and you’re framed in a little box. What’s behind you takes on a different level of importance too: the lovely lilies in the backdrop can appear to grow from your head online. BB: The use of virtual platforms for everything from job interviews to networking has become more commonplace and acceptable. How do you see introverts benefiting from this? NA: Virtual job interviews and networking present great opportunities for introverts because they enable us to control the spigot on our interactions. With the physical distance of online video, you can enjoy the comforts of your introvert’s cocoon where you can concentrate without anyone walking up behind you, standing too close to you, or checking out your workspace. You can also stick Post-Its onto your computer monitor rather than keeping all of your talking points in your head—so you don’t have the pressure of thinking up all your points in real time. BB: Would you share a few tips with us on how to appear natural and relaxed in front of the video camera? NA: Scrunch up your face, raise your shoulders to your ears, shake your body like a wet dog, and reach for the sky—before the cameras roll. Then, once you’re on, breathe, with conscious inhales and exhales rather than scared little breaths. Look at the camera like it’s an old friend. I’ve even heard taping a photo of a friend next to the lens can help. If you’re an introvert, since you thrive on one-on-one conversations (versus large-group interactions), just regard the camera as your conversation partner. BB: If an introvert entrepreneur wanted to dip his or her toes into the online presentation waters, what are the most important things to consider before getting started? NA: Set up a few private practice sessions with a trusted colleague. Rest up, prepare, and practice, since you’re less inclined as an introvert to just spit out your best thoughts on the fly. Take your time to think about them first, and rehearse until you’re comfortable with your delivery. BB: If someone wants to learn more about speaking effectively online, what would you recommend? BB: What if I’m ready to move right into hands-on learning? Are there any online courses out there? So happy presenting—and do it virtually, now! BB: What’s been your experience with online conversations and presenting? What’s worked, and what hasn’t? Please share in the comments! Great tips Beth and Nancy. It is unnerving to do webinars where you can’t see and often hear your audience, but I like Nancy’s tip about imagining talking to a friend. Be conversational. I also love the tip of putting a friends photo next to the camera when you’re doing a video. I’ll have to try that.